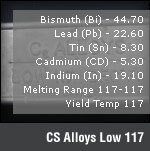 In addition to having low melting temperatures CS Alloys are virtually non-shrinking; several expand or grow after they are solid. All are relatively soft and brittle. 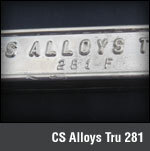 Some, like CS Alloys, work soften. 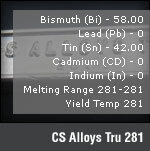 All have high density, averaging about three cu. ins. per pound. 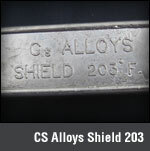 The numbers in parenthesis refer to other CS Alloys literature giving more details on the specific end use. Write for your copy. 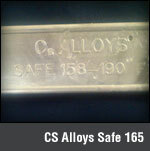 CS Alloys is a low melt alloy manufacturing company. 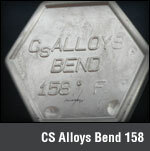 Our staff has over 35 years of experience in low melt alloys in both technical and in the manufacturing of the Low Melt products. 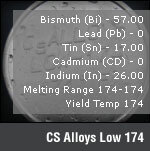 Low melt alloys or Fusible Alloys are alloys that are made up of Bismuth, Lead, Tin, Cadmium, and Indium. 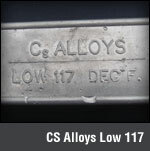 Low melt alloys can expand up to 3.3% when solidifying from a liquid to a solid depending on the product. 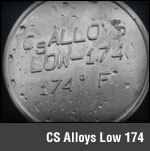 CS Alloys offers low melt alloys for a wide variety of industires and applications. 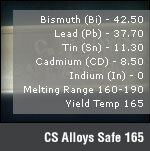 Some typical application include medical block of unwanted radiation, plugs for compressed gas tanks and molding of some plaster, plastics and encapsulations. 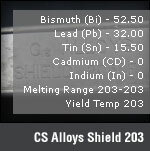 CS Alloys and/or this website is not affilliated in any way with Cerrobend, Cerrotru, Cerroshield, Cerrolow, Cerrosafe and these brands neither endorse nor sponsor any of the products and/or services that we provide. 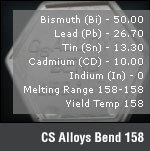 Our use of these brands are intended only to give examples of specific products that our products and/or serivces can help. These brands are registered trademarks of their respective owners.